Ninety-year-old Connie Cohen walks 11 blocks from her home to the Stanley Issacs Neighborhood Center on East 93rd Street several times a week. She eats lunch, gets a medical check-up, and talks with her fellow senior citizens -- about flu shots, physical ailments, the recently departed ... and political power. "When older Americans go to the polls on November 5," 85-year-old Helen Farhi reads aloud from an article in the American Association of Retired Persons newsletter, "their votes could decide not only the elections' outcome, but the future of Social Security and Medicare - including prescription drug coverage." She looks up at the dozen other women in the center's Tuesday Morning Discussion Group. "See, I always say that it is very important for us to vote," Farhi says. "We have to register, we have to know what is going on, and we have to vote." Older New Yorkers represent the fastest growing age group in the city. The number of city residents over 85 years old increased by 19 percent in the last 10 years. They are also increasingly women who live alone and depend heavily on government and privately funded services. And the elderly vote -- more than any other age group. In non-presidential election years like this one, younger voters tend not to show up at the polls, making older voters even more powerful. Is New York City prepared for its aging population? Are elected officials focusing on ways to meet the challenge of providing the basics of housing, food, and medical care? There are over 1.3 million people in New York City over the age of 60, the eligibility age for federal programs. Not only is the number of older New Yorkers growing, but who they are is changing as well. "The median income for a single senior citizen in the city is $10,450 a year," said Bobbie Sackman of the Council of Senior Centers and Services, an organization that represents 265 senior service organizations. "They do not fit the stereotype of the person who has a vacation house in Florida and plays golf everyday." The increasing number of older New Yorkers is just the beginning of the coming trend. In the next few years, the first wave of the baby-boom generation, the largest segment of the population born after World War II, will reach 60. The New York State Office for the Aging has launched an initiative entitled "Project 2015: The Future Aging of New York" to look at how the state must prepare to meet the housing, health care, and transportation needs when a quarter of the state's population reaches retirement age. When people think of elderly and senior programs they often name national programs like Medicare and Social Security. But New York City actually bears a considerable portion of the responsibility for providing and funding programs that assist older residents. Unlike most states, New York requires local counties to pay a quarter of Medicaid costs. And over the last two decades, federal funding for the city's Department for the Aging has been reduced from 70 percent to 30 percent of the agency's budget. The city is responsible for dozens of services, including assistance with housing, meals, health care, and significant funding for the city's 336 contracted senior citizen centers. "Our biggest concern is how to find funding to provide services [meals, medical care, and social activities], especially during a budget crisis like the city is going through now," said Wanda Wooten, the executive director of the Issacs Center. Last year during the city's budget process, Mayor Michael Bloomberg proposed closing seven senior citizen centers and eliminating delivery of weekend meals in order to help close the city's deficit. In May, several thousand senior citizens protested in front of City Hall. At the end of the budget process in June, none of the senior citizen centers were closed and no meals were eliminated. This year, the city faces another $5 billion deficit. Bloomberg is once again looking for places to cut. Because the federal and state governments mandate that certain funds go to specific programs, the city can only cut from about $15 billion of its $40 billion annual budget. Much of the money in the Department for the Aging budget falls within that category that can be reduced. "The mayor recognizes that older New Yorkers are a tremendous resource to the city and he's sensitive to aging issues, so we are discussing everything, looking at all alternatives," said Department for the Aging Commissioner Edwin Mendez-Santiago. "The mayor says that by law, we have to balance the budget, but we will try to do it in a way that does not compromise the well-being of our elderly." Housing is a serious issue for New York as a whole, but with an elderly poverty rate twice the national average, it is especially critical for older residents. Much of the affordable housing in the city was originally designed with young, working-class couples in mind. But because of the difficulty of finding housing, many seniors still live in the same apartments they moved into decades ago and either live alone - which creates challenges for people in caring for themselves - or with their children and grandchildren - which presents a different set of challenges for family members. In recent years, the trend is to provide services to the places where people already live. "[We are] committed to assisting frail seniors in maintaining the highest possible quality of life by remaining in their own homes and resisting institutionalization for as long as possible," said Commissioner Mendez-Santiago. "Nursing home care should be a last resort." The result is what aging experts call naturally occurring retirement communities, or "NORCS": an apartment building, housing complex, or neighborhood not originally built for seniors, but where many have aged in place. There are more than 28 such apartment complexes in New York City. Co-op City in the Bronx, which has over 8,000 residents over the age of 65, is considered the largest naturally occurring retirement community in the nation. In 1994, the State Legislature began funding senior programs and services in these housing complexes. In 1999, the City Council began allocating money for the programs as well. And as New York grows older, the city will have to figure out how to replicate these programs in many more apartment buildings. "The overwhelming majority of seniors who will require some sort of health and social services over the next 20 to 25 years are already living in precisely the same places they will be when those needs for service develop," said Fredda Vladeck, of the United Hospital Funds Aging In Place Initiative, which helps provide funding and assistance for such programs. However, providing services to apartment complexes is costly. Co-op City, which employs 40 staff, including two nurses and four social workers to work with residents, is always on the verge of going broke. But faced with the alternatives of expensive assisted living or going to a nursing home, most people say they prefer to stay in their homes. Last year, the Department for the Aging helped provide some 12.5 million meals; 3.6 million were delivered to people in their homes. These efforts, however, are only reaching a portion of the city's hungry, according to a recent report by Public Advocate Betsy Gotbaum. There are currently 505 homebound senior citizens on the waiting list for Citymeals On Wheels, a program that delivers meals to 17,000 homebound elderly every year. The study also questions why New York City is not making better use of federal money for food stamps. In recent years, San Francisco and Houston have increased their food stamp distribution by ten percent, while New York has decreased its program by two percent. "The city must work harder to ensure that no New Yorker goes hungry," said Gotbaum, "especially when we have a tool at our disposal that costs the city nothing." Like most low-income medical coverage, most prescription drugs programs come from the federal and state government. The Elderly Pharmaceutical Insurance Coverage, known as EPIC, is the New York State sponsored prescription plan for senior citizens who are 65 or older and who live on less than $35,000 a year if they are single, or $50,000 a year if married. Over 290,000 seniors are enrolled in the program. However, many seniors do not qualify for coverage and must spend hundreds of dollars a month on presecription drugs. Elected officials offer plenty of ideas for how to address this issue. This year in Congress, there is a push to have a new prescription drug benefit program signed into law. Candidates for office in the State Legislature are talking about the so called, "pharmaceutical justice bill," which would prohibit the sale of drugs in New York at a higher price than in countries like Switzerland and Canada. And in the City Council, there is legislation that would require city hospitals to purchase prescription drugs only from companies that agree to provide at least a 25 percent discount to low-income seniors and Medicare recipients. However, because of opposition from drug companies, as well as the sheer size and expense of the undertaking, it is unlikely that these proposals will become law anytime soon. Another local problem is that the cost of prescriptions varies from neighborhood to neighborhood, and even from store to store. A recent survey of the city's pharmacies found, for example, that four different drug stores on the Upper East Side charged four different prices - ranging from $50 to $98 - for the same osteoporosis medicine. "It is imperative that senior consumers are educated on their options, that businesses disclose prices clearly and fairly, and that we seek ways to help these seniors," said Department of Consumer Affairs Commissioner Gretchen Dykstra, who commissioned the study. Seniors vote in larger numbers than any other group. "People over 65 is the highest voting group and the only group that has increased its turnout since the 1960s," said Curtis Gans, who studies voting trends at the Committee for the Study of the American Electorate. "They're the last generation imbued with a sense of social civic duty." The fact that older people vote also means they are targeted with deceptive ads, legislation that has no chance of passing, and empty political promises. The challenge for voters is to figure out which candidates have solid ideas and the power to make them reality. Even local politics plays a big role in what services the city can provide. Each year during the budget process, the 51 members of the New York City Council fight for small grants to use in their home district. "We are increasingly dependent on special funds from politicians - what is sometimes called pork," said Wooten. "Those discretionary funds are really our bread and butter." 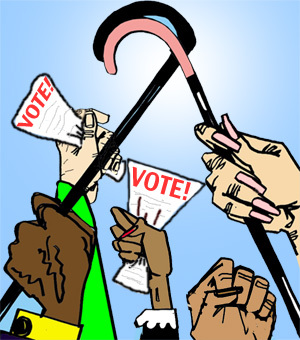 Like any special interest group, seniors are sometimes criticized for voting only with their issues in mind. And politicians are sometimes accused of pandering to older voters at the expense of other issues. "You can't fault seniors for voting," said Sackman. "And I find that when many politicians see the poverty rates among the elderly they are shocked. They often don't think of poverty as an elderly issue." The next wave of older New Yorkers will likely live and age differently than current and past generations. Experts expect that in the future New Yorkers will work longer, be healthier longer, and have to depend more on personal retirement savings than in the past. They are also more likely to be single, childless, or single parents -- which raises questions of how they will be cared for later in life. And it is unclear if the next generation will use services at senior citizen centers - that people like Helen Farhi and Connie Cohen say is their "home away from home" - 20 years from now. "Whether baby-boomers will go to senior centers is one of the big questions that no one knows the answer to yet," said Wooten. "They are independent. They are consumers. They are used to having things a certain way." To learn more about senior citizen issues in New York City, join Gotham Gazette's live chat, Thursday, Oct 17 at 12:00 p.m. Donna Tessitore, Assistant Commissioner, Bureau of Senior Assistance and Benefits from the city's Department for the Aging, and Gretchen Dykstra, Commissioner of the Department of Consumer Affairs will take your questions. LongtermCareLiving.org, a consumer information site sponsored by the American Health Care Association and the National Center for Assisted Living.